This is the second book in The Aspect-Emperor series, which itself is the second trilogy in a projected nine-book sequence called The Second Apocalypse. The first series, The Prince of Nothing was one of the best fantasies of recent years; the first book of the second trilogy, The Judging Eye, was, in some ways, better paced, but, overall, didn’t live up to that standard. The White-Luck Warrior is both a little better and a little worse than its predecessor. There are three main elements to the story: the northward trek of boy king Sorweel amid the Great Ordeal, the gargantuan army led by Aspect-Emperor Anasûrimbor Kellhus, to do battle with the Unholy Consult at Golgotterath; the near-parallel northward trek of Drusas Achamian, Anasûrimbor Mimara (the Emperor’s step-daughter), and a band of scalpers to the legendary Great Library of Sauglish; and the machinations back at the Imperial capital Momemn involving the Emperor’s wife and regent, Esmenet, her psychotic five-year-old son, Kelmomas, the Empire’s religious leader and half-brother of the Emperor, Maithanet. This latter area of the plot also includes the introduction of the eponymous White-Luck Warrior, a mysterious figure on a divine mission to kill the Emperor, whom the gods fear and hate. 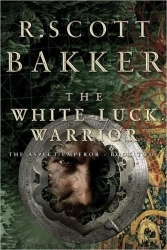 The White-Luck Warrior himself is only a minor character and his origins, nature and destiny remain mysterious throughout the novel – which is not exactly satisfying, given that the book is named for him. Also, the cosmological underpinnings of the world of the Three Seas are explored in a little more detail than in previous books (or maybe I just thought about it more). It’s still not clear to me exactly what I should believe about this world. This is probably deliberate on the author’s part – this ambiguity is essential to the tension over whether the Emperor is ultimately a force for good or evil. There are apparently one hundred gods (the Hundred), which are fragments of the God of Gods. Yatwer, the Mother, is crucially important to the background of the story, but my sense of her and these other subsidiary deities is still very vague. This is a longer book than The Judging Eye, and as such it feels more complete and does more. There is more reflection and philosophising present – which is a double-edged sword: it is part of Bakker’s unique style, but it also becomes tedious and is not always easy to understand. A lot of the extra bulk of the story is taken up with travel. The first two plot threads mentioned above basically represent the characters involved getting from A to B. These journeys are enlivened by dramatic confrontations – especially an epic battle between the Men of the Ordeal and limitless hordes of Sranc (although this takes place early on and leaves the narrative with a feeling of having peaked too soon); they are still just long passages of people travelling, however, and not the most edifying read. The other thing that makes Bakker’s work a cut above the rest is his writing. He writes in an elevated style that recalls Tolkien, but without the naïve nature poetry; small but significant parts of the narrative give you the feel of reading the fictional history of the events described. However, the pleasure of this exercise in quasi-archaic language is compromised by some of the author’s lexical choices – specifically, anachronistic words like ‘okay’ (nineteenth or early twentieth century slang) or phrases like ‘the end of the line’ (a train travel metaphor – not really appropriate for a world in which trains don’t exist). Additionally there are numerous misuses of language that should have been picked up during editing and proofreading; using ‘trod’ as a present tense verb, ‘loathe’ when ‘loath’ was meant, and ‘breath’ when ‘breathe’ was meant – all of these examples occurred more than once. Extremely annoying and disappointing. On the other hand, Bakker, like Iain M Banks, has a special genius for inventing names and nomenclature that give his secondary world a unique texture and authenticity. The Aspect-Emperor commands Exalt-Generals and Exalt-Ministers, Believer-Kings and Palatines, Grandees and Satraps, Patridomoses and Chieftain-Generals. The Great Ordeal is populated with Ainoni, Agmundrmen, Kidruhil, Ketyai, Cengemi, Conriyans, Shigeki, Tydonni, Invishi and Nilnameshi. The sheer number of names and terms is pretty bewildering, but it adds something vital to the baroque texture of the work. Despite its flaws I enjoyed reading The White-Luck Warrior – just about. It was pretty dry in places and Bakker runs the risk of flogging a dead horse with his characters’ constant navel-gazing. Still, now that most of the characters have arrived at where they want to be, the scene is set for a fascinating and dramatic conclusion to the series in The Unholy Consult.